As a bird blogger there comes a time when birding supersedes blogging. And such is the case these last several days. I would rather write one big blog, than to miss an opportunity to go birding during migration when things are really firing up. So to start, last Sunday I made a deal with Kathy that I’d do the grocery shopping if I could get the morning off to do a little birding. DEAL. So I was off to Riverside park in Newtown right across from Newtown Farmers Market, where for the last several days a Long-billed Dowitcher and other cool stuff had been hangin’. Across the road from the park is a grass field that was retaining water and the perfect location for your wading type birds. Spotting the Dowitchers was easy enough, telling the difference between the 2 species is an entirely different matter. There were 3 Dowitchers and one was very different from the others, so this was the one I focused my attention on. Doing a side by side comparison with the other 2 and studying the field marks I felt confident that we had 2 Short-billed and 1 Long-billed Dowitcher. After 30 minutes I was planning on going home but I had a great idea that maybe I should drop by Avoca Park that’s right on the way back towards home. I’ve only been to Avoca Park once before and it was for a very short visit. This time I thought I’d walk into the woods a little and get a feel for the park. And what a great feeling it was. Warblers were everywhere. Yellow-rumped Warblers were to numerous to count after a while and Nashville and Blue-winged were always on either side of me as I made my way slowly along well maintained trails. I could have stayed a whole day, but a deal is a deal so I headed home to keep my end of the bargain. Now yesterday with Kathy in school I thought a quick stop at Ellis Lake & West Chester Wetlands was in order. With all the rain lately and a few reports that came across the “sightings log”, there appeared to be some decent activity going on. As I pulled into the parking lot me eyes were towards the darkening sky than the birds feeding in several large sky pools. With the rumble of thunder in the background I quickly noted all the species that I saw and did some quick calculations as to how many and left with lightning showing up on the horizon. 30 minutes just isn’t enough time to thoroughly count all the different species in a given area. However by the time I got going the rain started to pick up in intensity, so by the time i got home it was coming down in buckets. So today John Marvin e-mailed me wanting to know if I wanted to meet over in Newtown again and see if we can re-locate the Long-billed Dowitchers. I got there first and started to scan the now larger body of water. John showed up a few minutes later and then we got serious. We moved down the side of the road to get a better view and to see if they were somewhere we hadn’t looked . John was the first to spot them. All told there were 3 Dowitchers. 2 of them were definitely Short-billed, however there was one that had that look to it. This is the one with that look to it. Maybe a possible Long-billed? I can’t believe that I caught this one flapping it’s wings. After leaving Newtown John and myself drove to Magrish Riverlands Preserve. We stayed for about an hour and covered as much as possible. I think some of the birds that were there yesterday moved on after the storms passed through. It was pretty quiet except for a couple of FOY birds, Philadelphia Vireo and Veery. At 6:30 we parted ways so we both could get home at a decent hour. If you haven’t noticed by now, yesterdays field trip involved following the Little Miami River north from California Woods, and ending at Grand Valley. Granted Daniel Drake Park doesn’t border the Little Miami, however it is on the way, so I stopped there first. Several weeks ago a Pine Warbler was sighted there, so I thought I’d see if the bird was still there. They have a nice stand of Evergreens which would entice me if I was a Pine Warbler. Now there’s something about Pine Warblers that drives me nuts. They sound almost identical to Chipping Sparrows. So for over an hour I chased down every song that sounded like a Pine Warbler, only to find it to be another Chipping Sparrow. A Pine Warbler was later spotted at Avoca Trailhead. From there it was a short drive to California Woods to try and find another target bird for the day, a Louisiana Waterthrush. Lick Run Creek runs through this 113 acre heavily wooded forest. And it’s along this creek that I hope to find the Waterthrush. 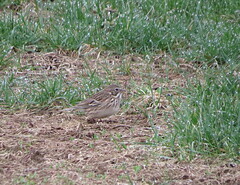 I’ve seen Waterthrush here in the past, and some recent sightings has given me confidence that I’ll spot at least one. I hope. For 30 minutes I walked up and down the road hearing and see everything but a Louisiana Waterthrush. I didn’t want to get too far away from the creek and hike up into the woods, even as tempting as it looked. At one point I went back to the bird-mobile and reacquainted myself with it’s song. 2 minutes later I hear the song coming from the nature center. The song was loud and clear and constant. I had it cornered in a bend of the creek prior to the bridge when it flew to a nearby tree and continued to sing. Getting a proper ID on it was the easy part, getting a picture was different. Like most Warblers, they don’t like to sit still long enough for photos. Digi-binning a was out of the question, so I pulled out my other camera and took this photo. I wish the Waterthrush was as cooperative as this Eastern Towhee. 2 minutes after leaving California Woods, I pull into Magrish Riverlands Preserve. This is one of my favorite spots for migrant Warblers and with the dry weather we’ve had lately, it should be relatively dry. Well I was correct on the dry part. For the hour I spent here I would have thought the birding would be better than it was. Picking up a couple FOS birds, I made my way to Armleder Park, where the bulk of the day I was going to spend. Armleder Park was a bustle of activity as I pulled in. I think every dog owner in Cincinnati had their dogs romping in the enclosed dog parks. That’s right they have 2 of them now. I guess it’s like an overflow parking lot for dogs. Families were out in force with young ones in tow as they biked, hiked, skated, their way around the paved paths that loop around and through the park. For myself it was onto the “Bean Field”. And what do my wondering eyes should appear, but Great Egrets. As the Sun rose higher, the morning frost finally melted away and more layers of clothing peeled off. Getting along into the late morning and early afternoon my target birds of Savannah and Vesper Sparrows were becoming harder to find. 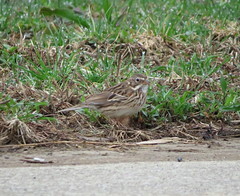 I did find one Savannah Sparrow as it hide under a bush. I dipped on the Vesper Sparrow but I did have some luck with 2 fly over Rusty Blackbirds. 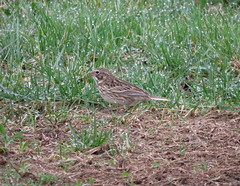 I did find one Song Sparrow that held still long enough for me to get these 2 pretty good pictures. The Tree Swallows were everywhere today. Laying claim to empty Bluebird houses, they were easy to photograph as they lighted on the post that held up the bird house. With a couple of hours till needing to be back home I left Armleder Park and followed the river to Avoca Trailhead Park. Situated along the bike trail this is a small park with river access. Plus it has a lot of potential for some good birding. This is where I picked up a Pine and Yellow-throated Warbler. With one more stop before home I left Avoca Trailhead Park on my way to Grand Valley. Which turned out to be rather disappointing. If there were any ducks on the lake they were all scared off by the fisherman and children playing. I was able to spot one lone Horned Grebe which I thought was a great find considering.